UPDATE: "For years, deficit scolds have held Washington in thrall with warnings of an imminent debt crisis, even though investors, who continue to buy U.S. bonds, clearly believe that such a crisis won’t happen; economic analysis says that such a crisis can’t happen; and the historical record shows no examples bearing any resemblance to our current situation in which such a crisis actually did happen." Read The New York Times, Fighting Fiscal Phantoms. "So it turns out that federal spending is important to the economy after all. . .
Republican lawmakers demanded the cuts last year as part of their brinkmanship over the debt ceiling, and business lobbies have generally supported slashing the deficit. But now that the cuts are imminent, corporate executives seem to have realized that the last thing the economy needs is a large budget cut across the board. They’re right about that. According to the Congressional Budget Office, the combined impact of the automatic spending cuts plus the scheduled expiration of the Bush-era tax cuts — the so-called fiscal cliff — would cause the economy to contract in the first half of 2013. Some business leaders seem to think the solution is for Congress to act as soon as possible to avert the spending cuts and to extend all of the tax cuts. That would avoid an economic downturn next year, but it would also mean no progress toward long-term deficit reduction"
Read The New York Times, Business Fears the Fiscal Cliff. Proving once again "Keynes’s basic point: slashing spending in a depressed economy depresses that economy further. It also proves that the Republi-cons are frauds. BTW, since the 2010 elections I've been waiting for the promised balanced budget, but don't hold you breath because the Republi-CONs Con the Tea Party, there'll be no $100 billion budget cut, and let's admit the obvious, the Republi-CONs are not serious about deficits. Dear God: Is it on purpose that our names are spelled the same, only in reverse? Dear God: When we get to Heaven, can we sit on your couch? Or will it be the same old story? Dear God: Why are there cars named after the jaguar, the cougar, the mustang, the colt, the stingray, and the rabbit, but not ONE named for a Dog? How often do you see a cougar riding around? We love a nice car ride! Would it be so hard to rename the 'Chrysler Eagle' the 'Chrysler Beagle'? 1. I will not eat the cat's food before he eats it or after he throws it up. 12. The cat is not a 'squeaky toy', so when I play with him and he makes that noise, it's usually not a good thing. It's a great country! Where else would something like this be done and published freely and openly so soon after such a closely contested election. UPDATE XIX: "After disappointing results in Tuesday’s election, Mr. Priebus said that it was time for Republicans to become "'more tolerant of those with a math-and-science lifestyle.'" Read The New Yorker, Republicans Consider Welcoming People Who Believe in Math and Science. UPDATE XVIII: And what organization had the most accurate polling? Read Talking Points Memo, Public Policy Polling Deemed Most Accurate National Pollster In 2012, which notes that 'lamestream media' easily beat Hedgehog News. Channel surfing, I briefly watched Hedgehog last night and it was a hoot as the hosts realized reality trumped partisan delusion. Trump pun intended. Hedgehog News brings to mind what George Orwell wrote in a famous essay, "In Front of Your Nose": "[W]e are all capable of believing things which we know to be untrue, and then, when we are finally proved wrong, impudently twisting the facts so as to show that we were right. Intellectually, it is possible to carry on this process for an indefinite time: the only check on it is that sooner or later a false belief bumps up against solid reality, usually on a battlefield." In this case, that battlefield was the 2012 election. Speaking of Trump delusions, did ya hear about the Trump twitter meltdown, he even called for a 'revolution'! You might remember that he's a birther and was once the next Republi-con celebrity candidate. UPDATE XVII: Numbers (and facts) have such a liberal bias. Read the Washington Post, Guess what? The polls (and Nate Silver) were right., Forbes, Three Lessons From The Nate Silver Controversy, Bloomberg, Nate Silver-Led Statistics Men Crush Pundits in Election. , and The Atlantic, How Conservative Media Lost to the MSM and Failed the Rank and File, which notes that "Nate Silver was right. His ideological antagonists were wrong. And that's just the beginning of the right's self-created information disadvantage." UPDATE XVI: Try The New York Times, 512 Paths to the White House, which allows you to "[s]elect a winner in the most competitive states . . . to see all the paths to victory available for either candidate." The interactive graph show that Obama has 431 paths to victory, Romney has 76, and 5 result in a tie, and each begins with who wins Florida. Real Clear Politics: 303 - 235 and 48.8 - 48.1. According to Robert Erikson, a prominent forecasting specialist at Columbia, and his colleague Karl Sigman, the polls would have to be wrong by four points for Romney to win. The article notes that a win by Romeny would be unheard of, '"[u]nheard of' doesn’t mean 'impossible,' of course, but it does suggest that Romney has tough odds to overcome Tuesday." For other forecasts and predictions, read the Washington Post, Pundit accountability: The official 2012 election prediction thread. UPDATE XIV: "The polls, taken together, are typically pretty accurate. Systemic problems, while possible, aren’t likely. There are a lot of pollsters producing a lot of polls and each and every one of them has every incentive to try and get it right. When they converge, it’s typically with good reason. And right now, they have converged. The 3-4 percentage point error necessary for Romney to be the real favorite in this race is extremely unlikely. Critics of the polls, meanwhile, tend to be self-serving. You don’t hear Romney supporters arguing that the cell phone users really are undersampled, and their candidate’s position is even more dire than it seems. Similarly, no prominent Obama supporters have argued that the polls are assuming an electorate that looks too much like 2008, and as such, are undercounting Romney’s likely support. Frankly, I’d be much more likely to take a critique of the polls seriously if it cut against the critic’s self-interest. But somehow, it never does. Self-serving critiques can be correct, of course, but because they’re motivated by what the critic wishes to see happen, or what the flack needs the media to think is happening, they deserve to be treated with suspicion. And because the pollsters themselves have clear incentives, more expertise, and a deeper understanding of the data, I tend to give them the benefit of the doubt. So here’s my prediction for tomorrow: The polls will prove to be right. President Obama will win with 290 electoral votes. I’m not extremely confident in the precision of that estimate: Some swing states are close enough that it’s entirely possible for a good ground game to tip, say, Florida into Obama’s column, or Colorado into Romney’s. Virginia is basically tied, and I’m giving it to Romney based on the assumption that challenger wins in a tie, but it could easily go the other way. So if Obama ends up winning with 303, I won’t be surprised." Read the Washington Post, Wonkblog, The polls will be right and Obama will win with 290 electoral votes. UPDATE XIII: If Obamney is so confident that he's going to win, why, in the final week of the campaign, do his campaign ads have an air of desperation? Read The New Republic, Chrysler, GM to Romney: Stop Lying and the Washington Post, Mitt Romney’s Kamikaze strategy and Romney video blames Obama for death of barbecue joint. Also read the comments on the last article. It seems Romney didn't do his due diligence, the restaurant had crappy food, bad locations, and health violations, and, to quote one former customer, was "a dirty dump". Really, does Obamney really think the president of the United States is responsible for failed restaurants, and that he's our great savior? UPDATE XII: With a week until the election, the chart below shows "'the estimated probabilities of an Obama victory and current Electoral College forecasts (where available) from the political scientists Jay DeSart and Tom Holbrook, Stanford’s Simon Jackman, Emory’s Drew Linzer, Silver, Princeton’s Sam Wang, the British sports book Betfair, and the Intrade futures market (here and here).'" We''l know next week whether these forecasts are correct, and whether the Republi-cons are just trying to create their own reality again. UPDATE XI: "[O]n June 7, the closest states were Colorado, Ohio and Virginia, each of which slightly favored Mr. Obama. In Florida and North Carolina, meanwhile, we had Mitt Romney listed as a modest favorite. Pretty much the same could be said about the race today. In fact, our projected leader in all 50 states is the same as it was at our launch of the forecast in June." Read The New York Times, Oct. 28: In Swing States, a Predictable Election? UPDATE X: "A straightforward read of the polls suggests we’re likely to see Mitt Romney win the popular vote and Barack Obama win the electoral college — and, thus, the presidency. But most pollsters don’t think that will happen." Read the Washington Post, Will Romney win the popular vote but lose the presidency? UPDATE IX: As of October 25, just 12 days before the election, there is not "any continuously updated model that shows Romney ahead. Nate SIlver’s model gives Obama a 71 percent chance of winning. 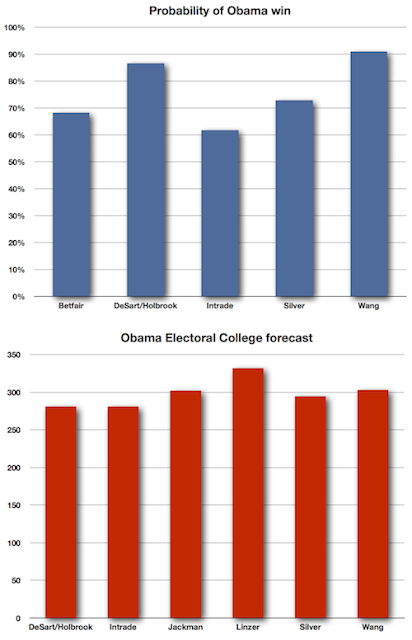 Sam Wang’s meta-analysis predicts 293 electoral votes for Obama. Drew Linzer’s Votamatic predicts 332 electoral votes for Obama." Read the Washington Post, Where the 2012 presidential election is right now, which in addition to the election forecast models, summaries the national and state polls, the campaign ground games, enthusiasm, early voting, and the momentum narrative. For earlier updates (July-October), see Who Will Win? Who Won the The 2012 Presidential Candidate Wife Cookie Contest? UPDATE II: "Polls — who needs them? You want election-picking accuracy? Try World Series winners, school-kid polls, 7-Eleven coffee cups and more." Read the Washington Post, Who will win the election? A few un­or­tho­dox indicators., which including the Chia hair growth forecast, the Redskins rule, and the Halloween mask predictor, as well as the cookie test below. UPDATE: And with "just 287 votes separated the two women, [the] smallest margin ever, the winner is . . . Read Politico, Michelle Obama wins cookie contest. Was it the white and dark chocolate cookie made with "two sticks of butter and a stick of Crisco" or the "the 'healthier' non-Crisco, non-flour, heavy-on-the-oats M&M cookie?" And which cookie was from which wife? And did you know that "all winners since 1992 have ended up living at 1600 Pennsylvania Ave—except Cindy McCain, whose borrowed recipe for oatmeal-butterscotch cookies beat Michelle’s lemon zest shortbread in 2008." Read Time, Obama Wins Crucial Cookie-Related Precursor to Re-Election. UPDATE: More proof that God must love Obama and sent a hurricane to rescue his campaign: "In a surprise announcement, Mayor Michael R. Bloomberg said Thursday that Hurricane Sandy had reshaped his thinking about the presidential campaign and that as a result he was endorsing President Obama." Read The New York Times, Bloomberg Backs Obama, Citing Climate Change. Unemployment is closely related to presidential approval ratings and G.D.P. growth, which, as noted before, are two of the three factors important to the outcome of the election. Ergo, God must love Obama. I am sure Pastor Poppins of Pensacola would agree.